Much has been written praising the new Liberal Defence Policy: Strong, Secure and Engaged. But when you consider what the Minister of National Defence stated, “Strong, Secure and Engaged was informed by the most transparent review Defence has ever undertaken,” and about what Mathew Fisher wrote, as part of his National Post article on July 1 about his interview with the Chief of the Defence Staff, General Vance, that “what was of crucial importance was that the policy review ‘for the first time in Canadian history lays the money out over time.’ After that it was crucial to maintain the ‘cadence of delivery’ according to the availability of funds and that ‘we have plans in place’ when they become available.” A virus was identified, one that immaterial of the “spin,” identifies Strong, Secure and Engaged as a partisan Liberal policy, just as the Canada First Defence Policy was a partisan Conservative policy, which will inevitably lead to policy failure – a failure similar to all previous Canadian Defence policies. Andrew Cohen concluded while commenting on a Maclean’s survey “Canadians are the luckiest people in the world – if only because in the lottery of neighbours, we drew the United States of America.” This geographical advantage has allowed Canadian Governments to dabble in Defence and Security policy while generally starving Canada’s Defence Forces as, in time, all Canadian governments find, with the possible exception of the Diefenbaker government, that the public will never hold them to account for their security choices. As Kim Richard Nossal points out in his book Charlie Foxtrot, “Certainly Canadian voters have not rewarded governments in power – or Opposition parties vying for power – that promise to spend more on the military in peacetime.” This mindset has plagued Canadian Defence and Security policy development from the beginning of this great country. Canadian politicians of all stripes historically squabbled over defence and security policy, failing to provide a realistic strategic policy for Canada. The result: governments of all parties have committed the men and the women of Canada’s armed forces to combat and hazardous operations poorly equipped. Strong, Secure and Engaged is really a set of multiple institutional wish lists rather than a strategic defence policy for Canada. Thus, it is hard to see how this policy is anything other than the status quo. This may seem to be harsh, but when one parses the details of the policy, the following emerges: a focus on a big and a busy army concentrated on Europe where NATO already has over 1.2 million citizens under arms to defend itself, and an air force in support of a big army and a small and limited navy. Cyber and space are mentioned, but not in a way to deflect from the status quo. The policy outcome – the reason for armed forces being the defence of the country and her people – seems to have been missed. Moreover, enjoying the accolades about the policy and adding some promised financial injection in the short-term and the promised major investments scheduled after the next election, the government has essentially shut down political and media discussion of defence and security policy until the next election, while sustaining the status quo and not facing major strategic decisions. But, sustaining the status quo creates an unspoken strategic outcome which is a policy failure. 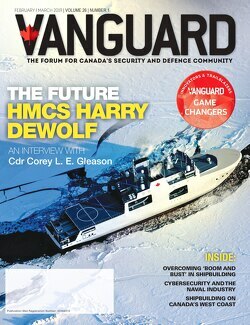 Canadian governments and the people of Canada tend to provide resources to adequately fund only two of Canada’s three services, let alone the new realm of cyber, and the status quo does not prioritize the air force or the navy – the two services that actually defend Canada. If they were really interested in defence, governments would not build a partisan policy which, with any change of government or circumstances will generally be ignored. They would develop a national approach for defence and security, developing policy and execution plans, including funding, that will transcend changes in government, policies and plans to meet the most important mandate of government: the defence and security of Canada and Canadians. They would also identify the funding tolerance level of the country and embed that number into law. In Canada, this number tends to revolve around 1 per cent of GDP, not the number promised in Strong, Secure and Engaged. Without a national strategic approach, the status quo will continue, as other options are difficult and contain perceived potential risk. As a result, the ability to make tough strategic decisions is absent, the term “balance” is bandied about, and the country is placed at risk. But for Canada, there is a need, strategically, for imbalance – an imbalance that mitigates the risk to Canada and Canadians. Only one army can invade Canada – and it is not likely to do so. Thus, what Canada needs is not a big, busy army but a defence structure based on the ability to control our airspace and beyond, our ocean approaches and beyond, and the means to deploy expeditionary capability by air and by sea. Thus configured, the Canadian Armed Forces would be capable of protecting Canada, contributing to global security, and supporting Canadian foreign policy at a cost acceptable to the Canadian taxpayer. Taking a strategic non-partisan approach to Canadian Defence Policy will take courage – courage to think strategically, courage to place historic service and partisan rivalries aside, courage to act in the best interests of the nation, and courage to be honest with ourselves. Ian Parker served over 37 years in the RCN, at sea, and in force development. For the past 12 years, he was an associate at CFN Consultants. He is the owner of GDS Inc.